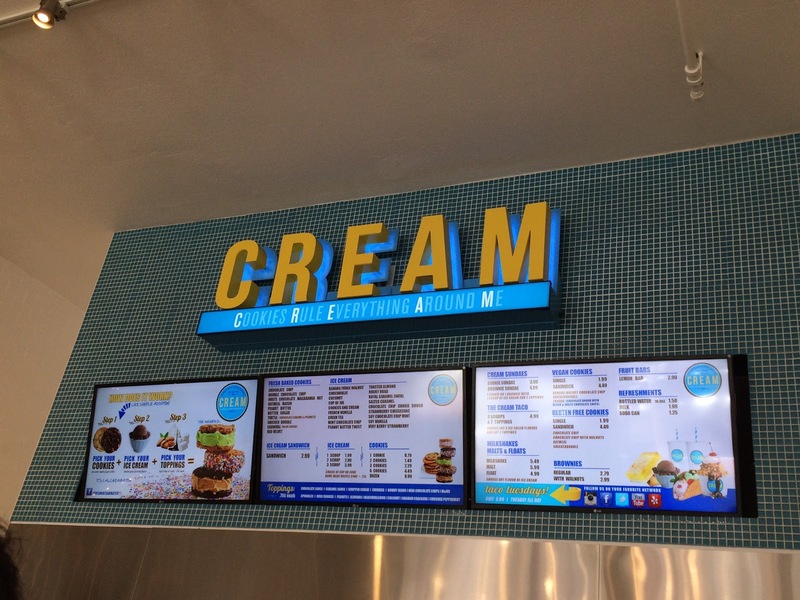 For the last hours in California, my husband found an ice cream chain called "Cream." The name is an acronym of "Cookies Rule Everything Around Me," and the first shop was opened in Berkeley, California in 2010 by Shamieh family. The ice creams and cookies are made with secret recipes. There're ice cream sandwiches, ice cream tacos, sundaes, floats and etc. 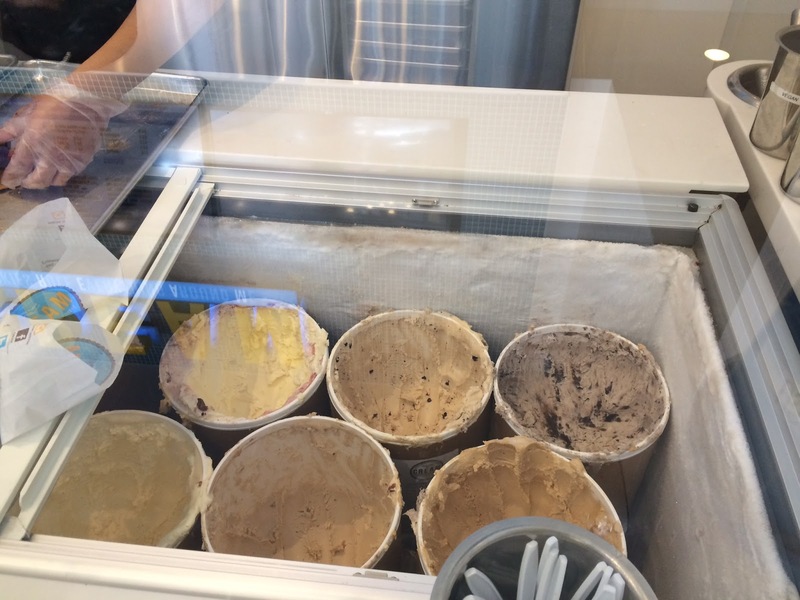 There're about 20 kinds of ice cream buckets sitting in the freezer and they gave us some samples. 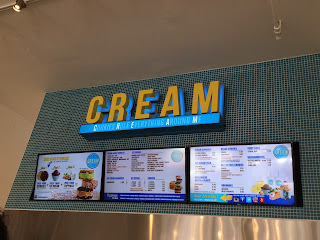 I was interested in tacos, but I didn't think I could eat several scoops, so I got a simple ice cream sandwich with Peanut Butter Swirl ice cream. 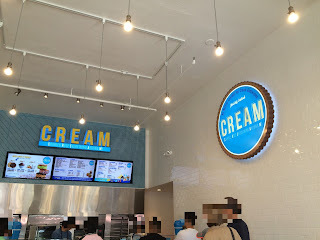 Not only the ice cream to choose, but the cookies were also my choice, and my husband chose M&M's cookies, which are called "Carnival" here with M&M's in parenthesis. The ice cream sandwich was put in a paper bag. 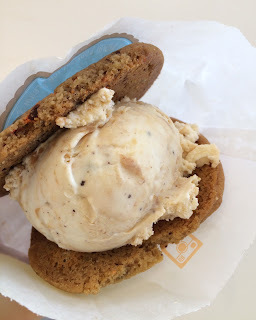 The cookies were still warm, and my husband said that they reheated the cookies before putting ice creams. 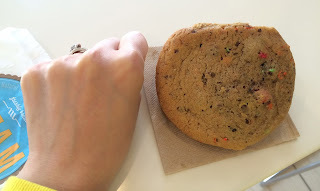 The cookies were as large as my fist. 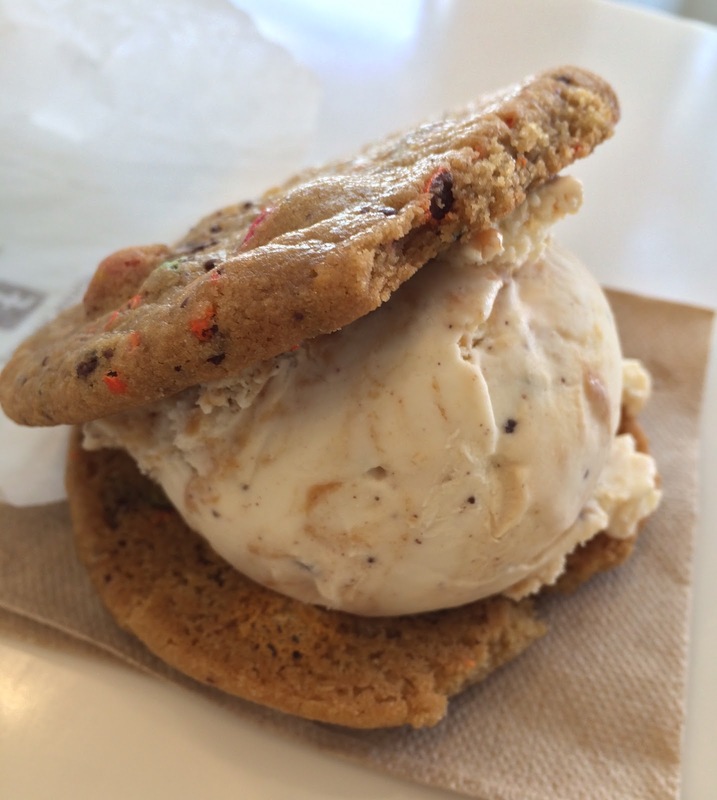 The scoop was quite large and in the light beige ice cream, there're peanut butter chunks and some chocolate chips. 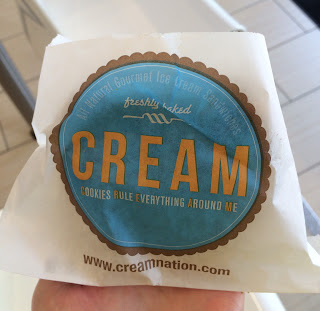 It's a tall ice cream sandwich and hard to bite into. With the heat of warm cookies, ice cream was subtly softer on the outside but still icy cold in the center. 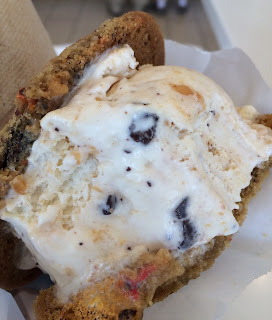 Cookies were very tasty and it's not a soft textured gooey cookies but crispy with M&M's chocolate chips. 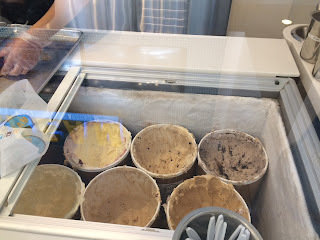 Ice cream was creamy, and peanut butter added saltiness and chocolate chips were crunchy and sweet. 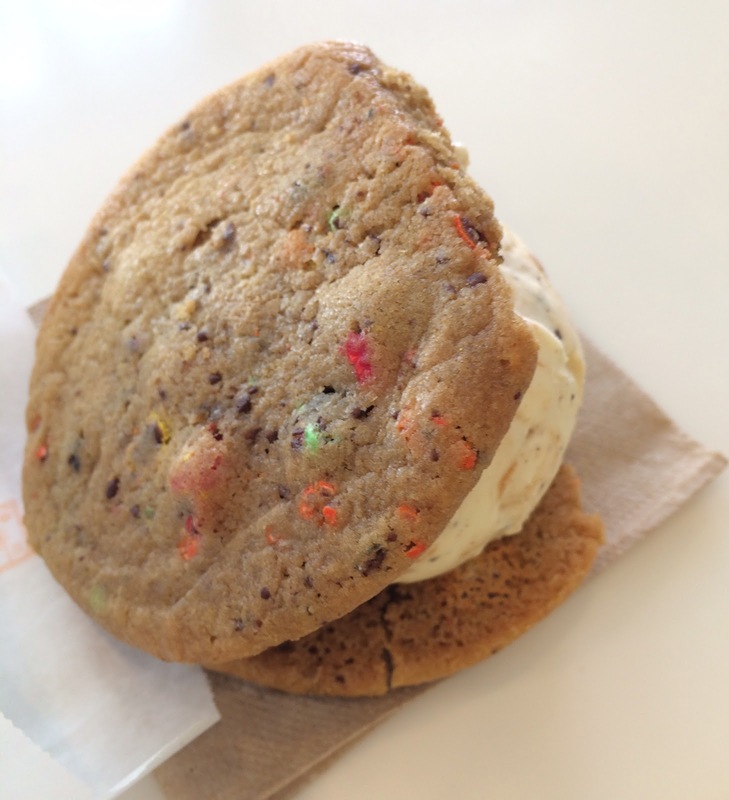 As they have so many cookies and ice cream to choose and combine together, there're numerous ways to enjoy sweets. 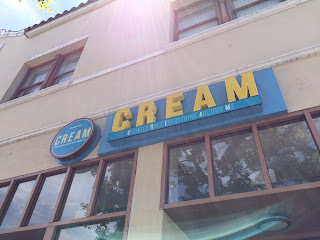 I'd love to go back when I'm nearby and have some different items.